The husband and I came up with this easy low carb recipe for my Keto Mother’s Day Menu. The were perfect. 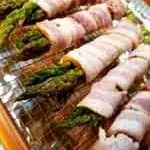 These Bacon Wrapped Asparagus bundles make a beautiful side dish that is as comfortable at a holiday dinner as it is on your week night table. There are a few truths in life, and as far as I’m concerned, this is one of them. Asparagus is good. 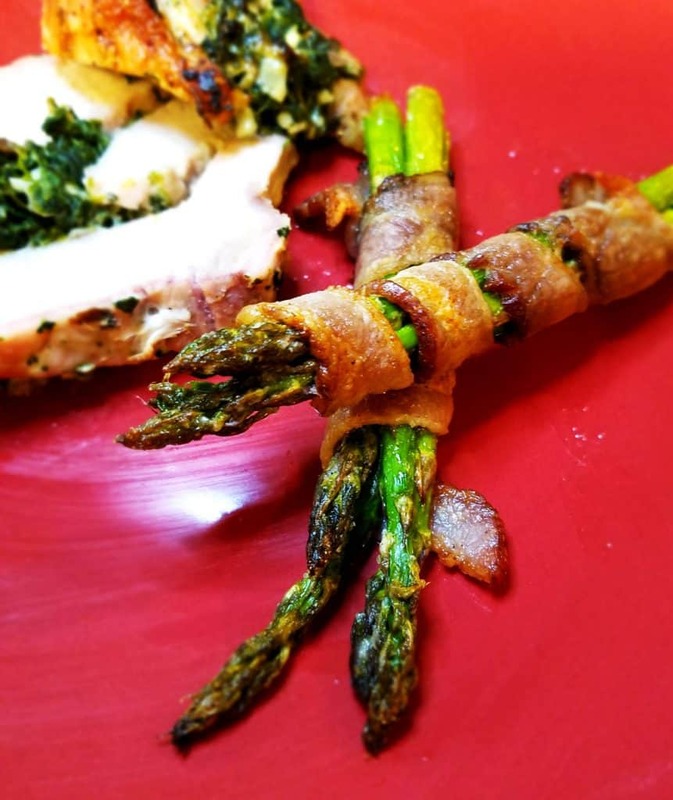 Tender asparagus, seasoned just right and wrapped in crispy bacon? Even better. 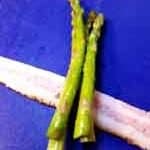 If you want to amp up the bacon, you can even wrap each spear of asparagus individually and you’ve got an appetizer that is sure to please. 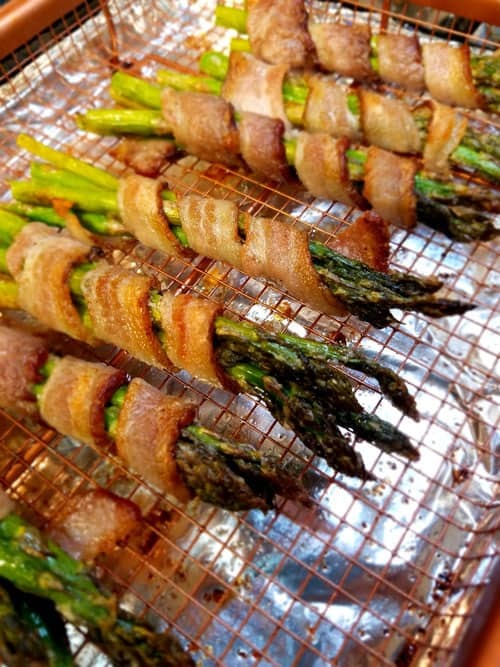 Tender asparagus, seasoned just right and wrapped in crispy bacon. Wash asparagus spears and break off the tough ends of the stems. If you have thick asparagus, each bundle will have two spears, thinner asparagus will get 3-4 per bundle. Eyeball it so that each bundle is roughly the same thickness. Roll the asparagus in the avocado oil to coat. Sprinkle with garlic powder, onion powder, freshly grated nutmeg, salt and pepper and roll again to ensure even coating. Prepare baking rack or sheet. We love our copper crisping rack (See Below), as it allows the heat to reach all sides and the food doesn’t sit in its drippings. (Linked in the notes below!) We line the bottom pan with aluminum foil for each cleanup. If you don’t have a crisping rack, line a regular baking sheet with aluminum. Cut each piece of bacon lengthwise with a sharp knife. Tightly wrap each bundle with a half slice of bacon, and be very careful that the bacon does not overlap. It will cook up crispier if it is all in a single layer. Place on rack or prepared baking sheet. Place in 400 degree oven for 10 minutes. Turn each bundle over using a pair of tongs and return to oven for another 10 minutes. Turn the oven to broil and move asparagus close the broiler. Watch carefully, as the bacon will burn quickly! You’ll only need to broil for 1-2 minutes to crisp up the bacon nicely. 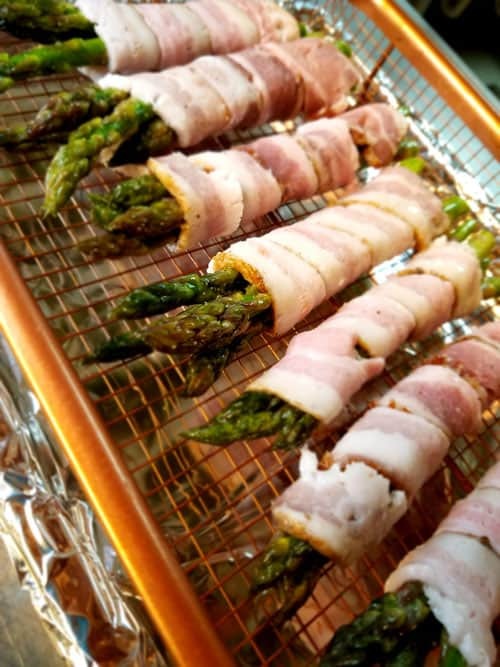 If you’re making this as part of the Ultimate Mother’s Day Keto Dinner, you’ll want to start prepping the asparagus and wrapping with bacon when the pork goes in the oven. Once it has 20 minutes left, put the asparagus in the oven on a separate rack. Don’t move to the broiler step with the asparagus until the pork is done and removed from the oven for resting. We love our copper crisping rack, as it allows the heat to reach all sides and the food doesn’t sit in its drippings. 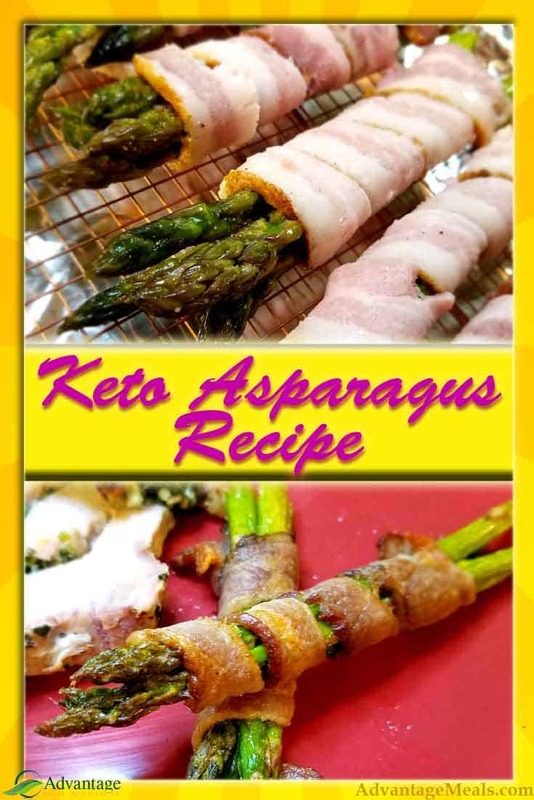 Everything is better with bacon and this keto asparagus recipe takes that to heart. There are a few truths in life, and as far as I’m concerned, this is one of them. Asparagus is good. Tender asparagus, seasoned just right and wrapped in crispy bacon? Even better. 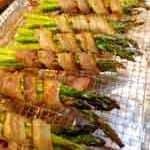 These Bacon Wrapped Asparagus bundles make a beautiful side dish that is as comfortable at a holiday dinner as it is on your week night table. 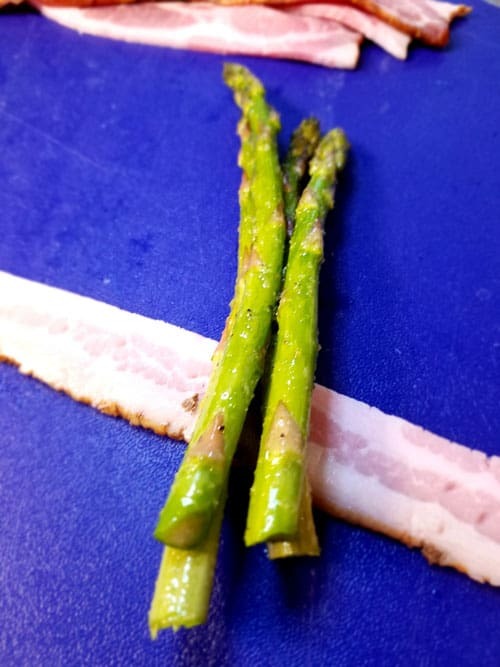 If you want to amp up the bacon, you can even wrap each spear of asparagus individually and you’ve got a side dish or appetizer that is sure to please. Prepare baking rack or sheet. We love this copper crisping rack, as it allows the heat to reach all sides and the food doesn’t sit in its drippings. We line the bottom pan with aluminum foil for easy cleanup. If you don’t have a crisping rack, line a regular baking sheet with aluminum. Place in 350 degree oven for 10 minutes. Turn each bundle over using a pair of tongs and return to oven for another 10 minutes. Turn the oven to broil and move asparagus close the broiler. Watch carefully, as the bacon will burn quickly! You’ll only need to broil for 1-2 minutes to crisp up the bacon nicely.